Your opinion matters. Leave A Review Or Edit This Listing for AMA FOOD PANTRY. 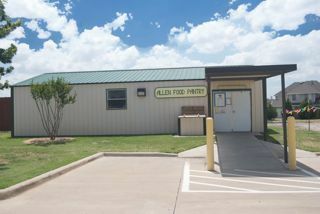 The Allen Food Pantry is supported by the Allen Ministerial Alliance which is made up of Christian churches in the communities of Allen, Fairview and Lucas and operates as a strict non-profit organization that is 100% Volunteer based. We serve those in need of food, including those out of work, Grandparents caring for grandchildren of unemployed children, soldiers returning from Iraq unable to find a job, and others who find themselves in financial difficulty. We always need more information on our pantries. If you know of any details, volunteer information, website, hours or more description information about AMA FOOD PANTRY please add a comment (below the map on this page), with information. We will then display this for all visitors on this page.